Flutes, Flutes, and more Flutes!! Hi my name is Bobbi (sometimes called the flute whisperer)! I graduated with a Bachelor of Music Education with a minor in Flute. After teaching music for a couple years, I went back to school to learn Instrument Repair from Red Wing Technical College. I worked for several music companies doing repair, sales and lessons before finally moving into my own business, Band Instrument Exchange. In 2005 Music and Arts approached me to join their family. 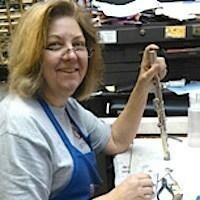 Since then I have enjoyed specializing in flute and piccolo sales and repair. The instrument selection Music and Arts has is fantastic and my favorite thing to do is find the perfect flute for every player from beginner to professional. Many flute teachers in the area trust me to work with their students to find that instrument that loves them back and gives the player the chance to be the best they can be. Through me you can find great flute brands such as Altus, Azumi, Muramatsu, Di Zhou, Dean Yang, Yamaha, Haynes and more! If you need help finding that magic wand that fits you please contact me at 281-330-5983.